Greg, I hate to “oh bother” you, but it’s time to review this next movie. Yes, let’s “return to pooh corner” and catch up with our old friends. 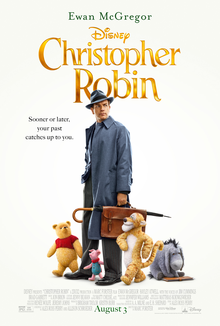 Christopher Robin (Ewan McGregor ) is leaving the Hundred Acre Wood for boarding school and must say good-bye to all his friends: Eeyore (Brad Garrett), Piglet (Nick Mohammed), Rabbit (Peter Capaldi), Kanga (Sophie Okonedo), Roo (Sara Sheen), Owl (Toby Jones), Tigger (Jim Cummings), and most of all Winnie the Pooh (Jim Cummings). Robin is later shown as a middle-aged adult living in London and working for a luggage company. He is a workaholic and very unhappy — although he may not know it yet. When the boss tells Robin that he must work the weekend to trim the budget, he returns home to tell his wife Evelyn (Hayley Atwell) and little girl Madeline (Bronte Carmichael) that he won’t be able to go to the cabin in the woods with them. They are upset of course. Then, when Robin feels exhausted from a long day at the office, he bumps into his childhood pal, Winnie the Pooh. Pooh is on a mission of his own. All his friends have “disrepeared” and he needs Christopher Robin to help him find them. So they go back to the Hundred Acre Wood in search of Robin’s childhood. Greg, this movie could easily have been called Saving Mr. Robin in the spirit of the 2013 film, Saving Mr. Banks. In the latter film, we are shown how a supernatural character named Mary Poppins arrives on the scene to cure a man of his workaholism. In Christopher Robin, we are treated to a different supernatural character, Winnie the Pooh, who arrives in time to save Christopher Robin of his workaholism. This movie’s simplicity is both its strength and its weakness. The strength lies in the powerful spiritual message of doing less to accomplish more, of staying in the present moment, and of being one’s true self instead of the self that others want you to be. It’s a strong message central to the teachings of several spiritual traditions, most notably Buddhism. The simplicity of the message is also its weakness, as the filmmakers really had to work hard to stretch the story out to 90 minutes. One could argue that such a straightforward lesson may really only require a 3-minute scene involving Pooh giving Robin some advice. Having said that, the nice thing about drawing the film out to its full length is that we witness the complete cycle of Christopher Robin’s heroic transformation. As a young boy, he enjoys the wisdom of childlike innocence. He even helps the animals in the forest with physical tasks, such as defeating the heffalumps and catching Pooh falling out of a tree. Now Robin himself “falls” into adulthood and all its superficial trappings, making it now the animals’ turn to rescue him. We know Robin has achieved redemption when on a train he engages in Pooh’s mindfulness exercise of noticing all the objects and people around him, calling them each by name. It’s a nice transformative arc for our hero. I was lucky enough to watch this film with my grown daughter. Winnie the Pooh was a big part of her growing up, and our time as father and daughter. We laughed, and cried, and loved it all. And it occurs to me that Christopher Robin had its work cut out for it. It needs to appeal to adults, new adults, and children simultaneously. To serve this purpose the writers very cleverly bifurcated the story between Christopher Robin’s rediscovery of his childhood, and then Pooh and friends joining with Madeline to have the goal of saving her father’s job. The first half of the film introduces the Hundred Acre Wood animals to a new audience while the older audience reminisces with Christopher Robin. In the second half of the film Madeline becomes the protagonist and discovers Pooh and the others to return Robin’s important papers to him before his big meeting. It’s a challenge to write a story with one clear protagonist with a singular goal. Here, we have Robin and his goal of saving his job, Pooh and his goal of finding his friends, and Madeline with her goal of saving her father. And at the same time, endowing the movie with all the charm and innocence the Pooh franchise has maintained for over 50 years. This was a perfectly crafted reboot of the franchise as it keeps all the original audience and welcomes a new one. Christopher Robin is a nice story of the price we pay when we dare to leave the wise confines of the Hundred Acre Wood in our lives. Yes, all of us must venture into the adult world, but this movie reminds us of the importance of retaining some childlike simplicity in our lives. There is a stirring sweetness to this movie that tugs not just on our heartstrings but also on our souls, which yearn for the simple life with friends, with the outdoors, and with the present moment. While I enjoyed this movie, it didn’t reach me as deeply as I thought it could have, and so I can give it no more than 3 Reels out of 5. Our hero Christopher Robin certainly traverses the full heroic arc by starting out enlightened, then losing that enlightenment, and then getting it back thanks to the mentoring of a certain honey-loving bear. The arc is a classic one, and we describe it in some detail in our last book, Reel Heroes & Villains. I give Robin’s heroism a total of 4 Hero points out of 5. With regard to archetypes, there are several worth mentioning. There is the innocent child, the corrupt adult, the corrupt corporation, the corrupt boss, and the unconventional creature who turns out to be the mentor. These and other archetypes merit a score of 3 Arcs out of 5. Christopher Robin is one of the few films I consider perfect in every way. It appeals to a wide audience, has extremely high production values, a well-written script, and characters we love and come to love. 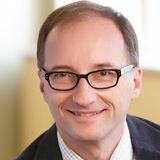 While the message that we need to connect with our inner child and our own children is a bit hackneyed (Sound of Music, Mary Poppins, and the upcoming Mary Poppins Returns), the wisdom and “Tao of Pooh” mentoring more than makes up for it. I give Christopher Robin 5 out of 5 Reels. There are so many heroes in this story, because everyone in this story wants something. Christopher Robin makes a fully hero’s journey as he falls from innocence and regains enlightenment through the mentoring of his childhood friend Winnie the Pooh. Pooh himself undergoes a journey as he first loses his friends, finds them, then befriends Madeline to save Christopher Robin. And finally Madeline herself goes through a heroic journey as she feels lost and forgotten by her father and ultimately saves him through her love and caring. I give them 5 out of 5 Heroes. And the archetypes I might add to your list Scott are the animals of the Hundred Acre Wood. Each represent a different facet of the human psyche. Eeyore pessimism, Piglet is paranoia, Rabbit is fear, Tigger is optimism, Owl is wisdom, and Pooh just is. I give these archetypes 4 out of 5 Arcs. By Greg Smith in 2018, 3 Archetypes, 4 Heroes, 4 Reels, Adventure, Animation, Comedy on August 20, 2018 .